"Two fascinating works by Johannes Berauer which could be the perfect sonic backdrop to many movies, titled Mizar A and Mizar B, written for bassoon, bass clarinet and human voice. A trio combination that works so well under the hands of Matthias Kronsteiner, Lisa Preimesberger and Philipp Sageder, that they should consider a complete album and tour as this unique formation." Program Notes: Mizar originated from the idea of creating a fusion of classical chamber music and Human Beatbox grooves in collaboration with vocal artist Philipp Sageder, member of the unrivaled vocal group Bauchklang. Mizar is a quadrupel star system in the constellation of Ursus Major. It consists of two binary stars and is in a distance of 78 light years to earth. 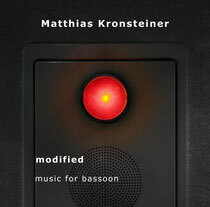 The Bassoon is featured as a solo instrument over big parts throughout the piece. Inspired by attitude and vocabulary of Jazz, it shines in virtuoso and improvisando style passages along the rhythmic grooves of the bass clarinet. The instruments circle around each other like the eponymous binary stars. The composition is supported by beats of Philipp Sageder, who merges beatbox sounds with syllables of the indian rhythmic recitation called Konakkol in his very unique way. It is granted that all sounds (except those coming from the horns) you can hear, are formed with the human voice.